President Obama and Vice President Joseph Biden will each hold a virtual huddle with grassroots supporters in Iowa and New Hampshire on the states' respective caucus and primary nights next month, campaign officials say. On Jan. 3, Obama will deliver remarks and take questions live-streamed over the internet exclusively to hundreds of Democratic caucus sites in the Hawkeye State. Biden will use the same tool on Jan. 10 to host a webcast meant to rally Democrats organizing at house parties across the Granite State during the primary vote. "This is another opportunity for President Obama to reach out and speak directly to voters on the ground," said Derek Eadon, Obama's campaign director in Iowa. "For Republicans this year, the caucus is an electoral contest, but for us the caucus is an opportunity for our supporters to have a conversation about the president's continued vision for a job-creating economy." Only attendees of the events in each state will be able to view and interact with Obama and Biden, a campaign official said. The video teleconferences will utilize a proprietary software program developed for the Obama campaign by Adobe Systems Inc. The president first used the program on his 50 th birthday in August, when he beamed in to dozens of house parties held in his honor around the country. He fielded several questions from supporters in battleground states through the program's video chat feature. Learn more about the online tool HERE. 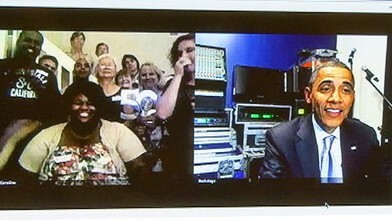 Watch ABC video of Obama using the system on his birthday HERE.